Our EM1 products (Concentrate and Garden) can be grown/activated one time for economical purposes. This "growing" or "fermentation" process is called Activation, in the past expansion. Doing this process yourself can save considerable amounts of money in both product and freight, EM can be expanded for as little as $1 per litre (please contact us for more details). This process is relatively straight forward and involves taking one part EM1, 1 part molasses, and 18 parts water. We recommend a 5% dilution of EM1 Concentrate with 5% Molasses to water e.g. To make 10 litres of EM-RTU, use the directions below. 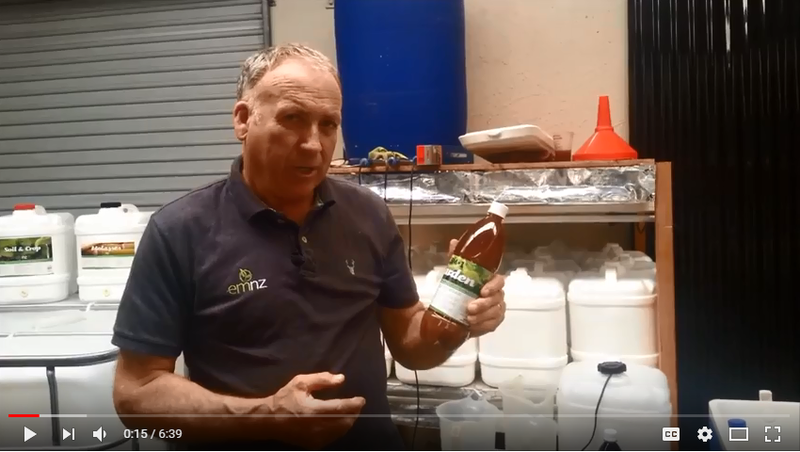 In these videos Mike Daly demonstrates how to activate large volumes – 200L -100L and smaller volumes 1L-20L. Always use clean equipment and chlorine free water (if water chlorinated then stand the water for 24 hours in an open container like a bucket, cover with muslin to prevent dust or other contaminants going into the water). Firstly add your molasses to your container and put about 30% of your water in as hot or boiled water, then stir the solution to dissolve the molasses, then add the balance of cold water, the EM can be added before you top off the container with water. Stir the EM into the solution. Next you add your heater or place in a warm room. The requirement is 25-35 degrees C. If you have a thermostat heater set it on 30 degrees C. Seal the top with a lid or plastic glad wrap. An airlock is ideal, alternatively you will need to release the gas by loosening the lid every day, or just keep the lid slightly loose so that the gas can escape. After 5-7 days, the Activated EM will be ready, we call this product EM Ready to Use (RTU). EM-RTU has a shorter life than EM1 Concentrate, and needs to be used within 2 months. Use a good quality blackstrap molasses. The initial fermentation process takes roughly 3-5 days. During this time sugars are being digested by the microbes. As they do this, they produce various acids that cause the pH to drop. You can easily measure this using some pH paper or a pH meter. When the pH of the solution drops to 3.8 or below and has rested at this pH for a few days, the EM RTU is ready to use. The target pH is 3.5.